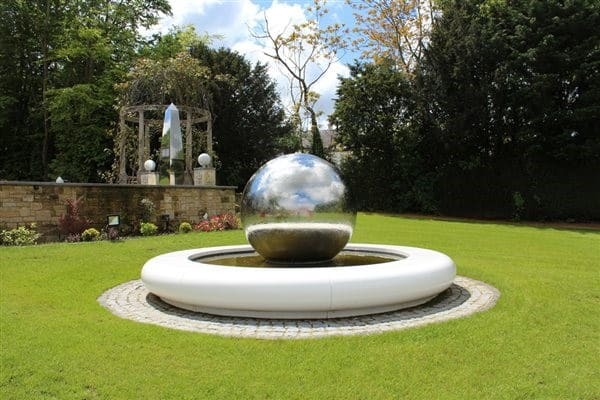 Sui Generis’ striking Aqua Corona fibreglass water feature has been installed into the home of one of the world’s most investigated and celebrated mystifiers, Uri Geller. Famous around the globe for his mind-bending abilities, Uri Geller, specified the contemporary water feature to sit alongside his outdoor modern art collection within the extensive grounds of his luxurious Thames-side home. Uri was searching for a ‘designer-piece’ to create an added focal point to his outdoor living area, and to double-up as a seating option for guests at his summertime garden parties. Aqua Corona is a circular hand-crafted water feature designed to transform garden landscapes and outdoor living areas. The stunning circular water feature is modular in construction and is easy-to-install into garden landscapes. Aqua Corona is also available in a semi-circular design and is highly durable, weather resistant and requires the minimum of maintenance. Last year the Aqua Corona water feature was specified at the Chelsea Flower Show to create a centrepiece for Hillier garden centres world-record breaking run of gold’s at the world-famous show. 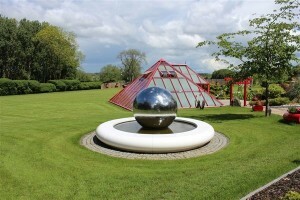 To view the full GeoMet range of water features and furniture, visit www.suigeneris.co.uk/landscape.